Because of the homemade cake and three different ice cream layers, this showy dessert takes time to make, but the oohs and aahs youll hear make it worth the effort. In a large mixing bowl, beat shortening with an electric mixer on medium to high speed for 30 seconds. Add sugar and vanilla; beat until combined. Alternately add flour mixture and milk, beating on low to medium speed after each addition just until combined. Thoroughly wash beaters. In another large mixing bowl, beat egg whites on medium to high speed until stiff peaks form (tips stand straight). Gently fold egg whites into beaten mixture. Pour batter into two greased and floured 9x1 1/2-inch round baking pans. Bake in a 350 degrees oven for 25 to 30 minutes or until a wooden toothpick inserted in centers comes out clean. Cool in pans on wire racks for 10 minutes. Remove from pans; cool completely on wire racks. 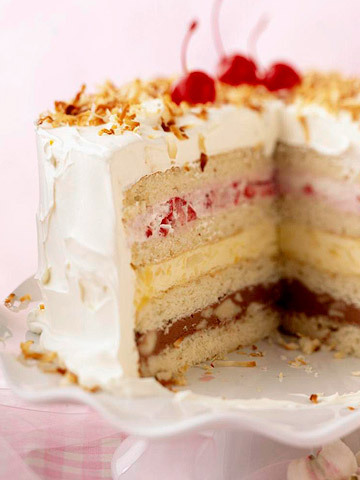 Slice each cake layer in half horizontally with a long-bladed, serrated knife. Place a 9-inch springform pan in a 15x10x1-inch baking pan. Place one layer of cake in the springform pan. Gently stir together chocolate ice cream and banana; spread over cake in pan. (It is okay if some ice cream runs down sides of cake.) Cover and freeze 30 minutes. Top with a second cake layer. Gently stir together vanilla ice cream and pineapple; spread atop second cake layer. Cover and freeze 30 minutes. Top with a third cake layer. Gently stir together strawberry ice cream and strawberries; spread atop third cake layer. Top with remaining cake layer. (Cake layer will rise above the top of springform pan.) Cover and freeze for 12 to 24 hours. To serve, remove cake from freezer. Remove from springform pan and place on a serving platter. Frost top and sides with dessert topping. Sprinkle with coconut and top with maraschino cherries. Let stand 20 minutes before serving. Store any remaining cake covered in the freezer. To soften ice cream: Place ice cream in a large bowl. Let stand 5 minutes; stir with a wooden spoon until just softened and spreadable but not melted.